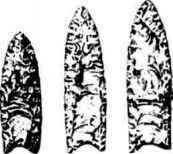 Subtle changes in these exquisitely crafted stone points are recognised as the product of two successive cultures of big game hunters in North America the Clovis and Folsom peoples. The upper quartz points were found associated with mammoth bones at the Lehner Ranch site in New Mexico. The razor sharp points were bound and 'glued' to a wooden shaft some 2 m (7 ft) long, perhaps with a detachable foreshaft to make a formidable weapon. got this far north and east, did they also venture the extra 2600 km further east across into Alaska well before 20,000 years ago? The old question of exactly where in Siberia the first occupants of the Americas came from now has a possible answer. It is an answer that supports the other evidence from archaeology, paleoanthropology (such as the study of Native American teeth), DNA and the linguistic 'history' of native 'Indian' Americans that the first 'Americans' were Asiatic Siberians. But there is also emerging evidence for successive pre-Clovis waves (or perhaps it would be better to say small ripples) of immigrants. It is highly unlikely that there was any mass rush to cross into an imaginary 'promised land'. On a clear day the mountains of Alaska can just be seen from the coast of Siberia. It is only 80 km (50 miles) between Chukotskoye Nagorye in northeast Siberia and the western tip of the Seward Peninsula in Alaska, a narrow strait covered by a shallow sea today. Nevertheless, confronted with a desolate barren plain and high snow- and ice-covered mountains beyond, the incentive to venture into such an unknown and inhospitable territory probably precluded all but the most adventurous or perhaps most 'foolhardy'. Initially, a few isolated small bands of hunters probably followed migratory animals out across the plain of Central Beringia. Active pursuit of game would have been very difficult on this featureless plain without cover and hunting may well have been confined to tracking down stragglers from the herds. Alternatively, they might have followed the coastal strip where they would always have access to shellfish. The very mobility of the hunters and the animals has left virtually no archaeological 'imprint' on the landscape. And, even if it did, so much of Beringia is once again under water and out of reach. So far, the earliest traces of these pre-Clovis settlers comes from the Bluefish Caves in the Yukon, perhaps dating back to at least 15,750 years ago and maybe as long ago as 20 ka. Canadian archaeologist Jean Cinq-Mars first spotted the limestone caves near the Bluefish River from a helicopter back in 1975. The variety of chewed bones (mammoth, bison, horse, sheep, caribou, moose, saiga, musk-ox) shows that the caves were primarily dens used by predators such as lion and cougar and scavengers such as wolves and bears, but some of these bones also look as if they have been fashioned by human hands, although not all experts agree. And there are stone artefacts - small flakes called microliths and the remains of the stone nodules they were broken from. Similar artefacts have been found elsewhere in Alaska, but none is any older than about 13 ka. Unfortunately, the Bluefish Caves do not provide really secure evidence for pre 13.5 ka settlement in Alaska, although they are the best available for this region at the present. There is a scattering of other putative pre 13.5 ka sites much further south, but many of these also have problems. And there is the problem of how anyone managed to negotiate their way through the glacier-bound northlands. The presence of the famous ice-free corridor between the ice sheets and glaciers has recently been thrown into doubt, especially prior to 14,700 years ago and the re-establishment of significantly warmer climates. The corridor would have had to be some 1500 km long, not a distance that could be quickly travelled on foot even by the hardiest of hunters. There would have been no firewood and precious little to eat. And yet there is some evidence for pre-Clovis people living south of the ice front at least 14 ka ago, first at the Meadowcroft rock shelter in Pennsylvania. Situated in Cross Creek Valley, a branch of the Ohio River, the rock shelter was first excavated in 1973 and the subsequent 30 years of detailed investigation have yielded some tantalising clues to early habitation. A woven plait of fibre that could have been part of a basket was dug out and has been dated at around 23 ka. Younger layers above contained stone tools and animal bones dated to around 18 ka. You might think that this would be unequivocal evidence for early settlement, but the problem is that the animals are temperate ones such as deer, chipmunk and squirrel that fed on oak, hickory and walnut trees. The site is only 80 km south of the ice front and should have been tundra at around 18 ka. Meadowcroft is in the middle of a coalmining region and the sediments are all contaminated with coal dust, which some experts believe has resulted in much older dates than they should be. But the excavator, James Adovasio, still protests that the dates are real and that the sediments are not contaminated with coal dust, so the jury is still out on this one. There is another site called Pedra Furada in northeast Brazil that has been claimed to be more than 40 ka old, but this seems even less acceptable to most archaeologists. The one other site that has really made people begin to accept the possibility of pre-Clovis people is that of Monte Verde. Monte Verde nestles on the narrow Chilean coastal plain, caught between the mountains of the Andes and the island-studded Pacific coast. Buried beneath the peaty banks of the Chinchihuapi Creek 30 km from the coast lie the remains of abandoned huts, work surfaces, hearths, cooking debris and rubbish dumps, all dated to between 14.5 and 13.8 ka. The rapid growth of peaty sediments over the site has preserved not just flaked stone artefacts but also some of the hut timbers, wood tools, animal bones (including the elephant-like extinct mastodon) and pieces of hide, along with knotted fibres. It was in the late 1970s that Tom Dillehay, an archaeologist at the University of Kentucky, began to follow up a find of bones made by the local Gerardo Barria family in the early 1970s. Dillehay started a programme of excavation at the site that was to take his team over 20 years to complete. By the time they had finished they had uncovered clear evidence for a small streamside settlement with two rows of timber-framed and skin-covered dwellings - a far cry from the frozen northern tundra. The Monte Verde people actually lived much closer to the Antarctic Circle (3500 km to the south) than the Beringian Arctic Circle (some 15,000 km to the north). They 'enjoyed' a cool temperate climate with abundant trees, shrubs, herbs and wild roots and tubers, including wild potatoes. Although initially there was considerable scepticism about the nature of the find and more especially about its age, Dillehay's meticulous work and careful documentation have gradually won over many but not all of the critics. There is also some scant evidence from possible stone and wood artefacts for an even earlier occupation at the site dated at 33 ka by scattered charcoal, but Dillehay himself is, as yet, cautious about this until more ground has been excavated. The argument now concerns how long it might have taken the Monte Verde people to make their 15,000 km journey from Beringia down to southern Chile. It has to have been in the order of several thousand years, since they would have been unlikely to move more than a few kilometres a year as they would have been encumbered with babies and children. Even at 5 km per year it would take 3000 years, meaning that they were in Beringia around 17.5 ka, but since the region was still in the final throes of a glacial that is highly unlikely. It is therefore more reasonable to speculate that they crossed Beringia before the last glacial. If so, then the Americas were occupied prior to 22 ka, before the last Wisconsinan glaciation took hold. Historically, the first evidence for the prehistoric settlement of the Americas was made back in 1908. Near Folsom, New Mexico, a cowboy named George Mcjunkin spotted some large animal bones and unusual-looking stones apparently embedded in deposits in the dry gully of a creek that flows down Wild Horse Valley from Johnson Mesa. Torrential rains in 1908 had washed the loose sediment out of the creek, exposing the heavy bones and stones. Mcjunkin dug them out and took them back to his ranch, where they languished for some 17 years. Luckily, instead of eventually being thrown out, in 1925 they found their way to Jesse Figgins, director of the Denver Museum of Natural History in Colorado, who recognised the bones as those of a large extinct bison. Figgins was intrigued, decided to investigate the site and was soon rewarded with the discovery of two stone spear points. He showed them to the Czech immigrant Ales Hrdlicka, who encouraged his excavations but told him to leave any future finds of stone artefacts undisturbed in situ. In other words, they were to be left exactly as they were, exposed in the sediment, so that they could be inspected by experts. Ales Hrdlicka, 1869-1943, Bohemian-bom anthropologist, studied medicine in America and became a homeopathic physician. Began a reassessment of sites associated with Native Americans, developing the idea that they originated in Asia. He joined the American Museum of Natural History, then the National Museum in Washington (Smithsonian Institution). By summer 1927 Figgins had a result and the experts duly gathered to examine a well-formed spear point in close association with bison bones. Barnum Brown, a famous palaeontologist at the American Museum of Natural History and finder of dinosaurs, was one of the experts and duly declared that 'the answer to the antiquity of man in the New World is in my hand'. He was wrong, but it was a good 'sound bite' and brought plenty of publicity to the find, jettisoning Figgins to national fame in the process. At the time there was no direct method of dating the find, only informed guesswork, and Figgins reckoned that the kill site might be around 10,000 years old. He was very nearly right and today, thanks to radiocarbon dating, we know that the Folsom points were made between 13 and 11 ka. Just five years later, in 1932, a new find surfaced in New Mexico, at Clovis, whose people we have met before. Bamum Brown, 1873-1963, fossil collector, especially of dinosaurs, who worked all over the Americas, India and Ethiopia, financed first by the Sinclair Oil company. Hired by Henry Fairfield Osborn for the American Museum of National History in 1897 and discovered the first skeleton of Tyrannosaurus rex in 1902. Two amateur collectors found beautifully fashioned stone points lying in dried-up lake-bed sediments along with animal bones. In the 1930s further sites with similar points closely associated with bones were found nearby at Blackwater Draw and up in Colorado at Dent, where mammoths had been the prey rather than bison. By the mid-1950s more Clovis sites had been found, including one at Naco in southern Arizona where a nearly complete mammoth skeleton was associated with eight Clovis points. 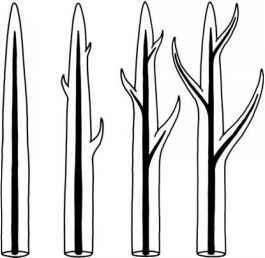 There is evidence of bone regrowth, suggesting that none of the spear wounds killed the beast and it survived for some time before dying, perhaps from natural causes or perhaps from the long-term effects of the attack. And then the remains of eight mammoths and twelve spear points were found nearby at the Lehner Ranch. When the first reliable dates became available for these Clovis sites, none was older than 13.5 ka. The Clovis hunters thus predated the Folsom people and became generally regarded as the first human occupants of the Americas. These Clovis pioneers soon took on an iconic status. Apparently on foot and armed with no more than stone-pointed spears, these people regularly took on giant mammoths and must have killed enough of them to make the effort and danger worthwhile. A further question arose: had people such as the Clovis hunters also been unwittingly responsible for an 'overkill', not just of the mammoths but also many other large and medium-sized mammal species, known as the Pleistocene 'megafauna' of the Americas? The 'overkill' hypothesis has been most vigorously promoted by Paul Martin of Arizona State University, who argues that the Clovis hunters entered the continent from Beringia, travelled down the ice-free corridor to arrive beyond the receding icefront around 13.5 ka. Small groups of hunters, 'old hands at hunting woolly mammoths and other Eurasian animals', according to Martin, then fanned out through the forests, woodlands and across the prairies within a few hundred years. They indulged in a veritable Blitzkrieg or feeding frenzy, which rapidly decimated their prey populations. Martin further argued that this protein bonanza soon produced a boom of little 'Clovises', with their population increasing at rates of 3-4 per cent a year, who in turn grew up into more successful hunters until the populations of their prey animals finally crashed. But not all experts agreed. What of the role of climate change? Such high rates of population increase with low infant mortality are unheard of among other hunter-gatherers. As we shall see the Clovis people may well have helped the megafauna on their way but, as so often happens in science and life, the story is turning out to be more complicated than first thought.